According to the union’s November 1 independent expenditure filing, the union representing 25,900 service employees had spent $1,006,236.66, an increase of $449,548.09 over their previous filing on October 26. 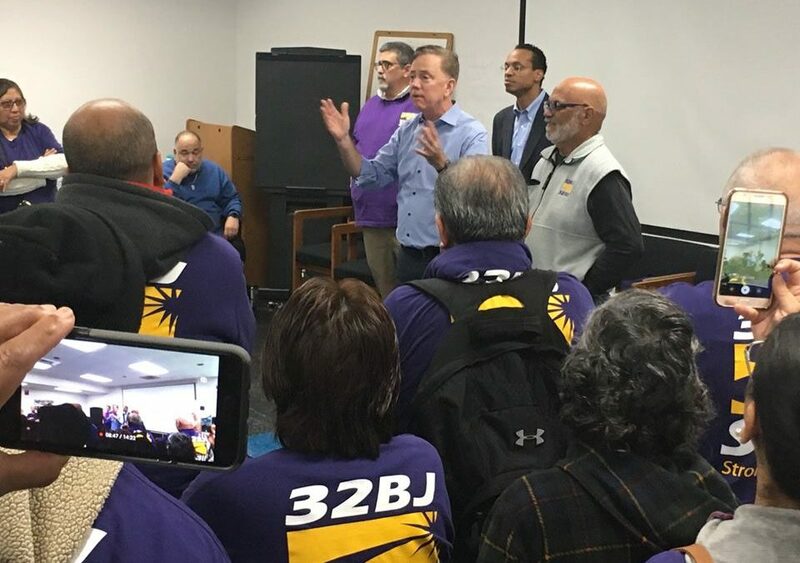 SEIU’s November 1 filing shows SEIU funneled $63,700 to Base Builder, LLC in Minneapolis, Minnesota for canvassers in Connecticut. Most of that money — $51,496.29 – was spent opposing Stefanowski, while the remainder was spent supporting four Democratic candidates for state Senate. By comparison, the Connecticut Realtors Association PAC – which has received much coverage in the media – has spent $635,561 supporting Stefanowski and Republican Representative Chris Davis of Ellington. Aside of Base Builder, SEIU spent $55,000 on digital marketing through Washington D.C.-based 76 Words, which ran advertising for Democratic gubernatorial candidate Ned Lamont, and senate candidates Mary Abrams, Julie Kushner, Jorge Cabrera, and Vicky Nardello. SEIU also spent $144,218 for canvass literature with Resonance Campaigns, another D.C. based campaigning company, according to their October 31 filing. Of all Connecticut’s unions – particularly public sector unions – SEIU 1199 has mounted the largest independent expenditure campaign in the state. Independent expenditures are political spending made by a political committee or individual which is not coordinated with a campaign. AFSCME has spent an additional $27,827.26 on independent expenditures since their October 26 filing for a total of $169,446.74. AFSCE, SEIU and the Connecticut State Employees Association combined have spent $1,258,842.55 in independent expenditures since July. However, political spending targeted to union members does not require disclosure to the state. Both AFSCME and the American Federation of Teachers have been sending mailers to members. 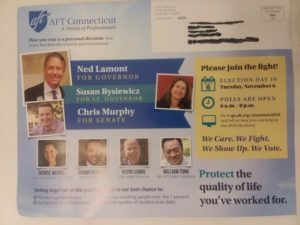 AFT’s most recent mailing encouraged members to vote for Lamont, Senator Chris Murphy, Comptroller Kevin Lembo, Secretary of State Denise Merrill, Attorney General candidate William Tong and State Treasurer candidate Shawn Wooden. Public-sector unions see this gubernatorial election as critical because the state is projected to face multi-billion dollar deficits for the next four years and will likely require further concessions from state employees to balance the budget. The governor negotiates contracts with state employee labor unions in private meetings. The unions heavily supported Gov. Dannel Malloy who also faced multi-billion dollar deficits when he took office in 2010 and negotiated two concessions deals with the State Employees Bargaining Agent Coalition in 2011 and 2017. Those concessions combined with tax increases in 2011 and 2015, however, were not enough to turn the tide of Connecticut’s continual budget problems. The rapidly rising cost of state employee and teacher pensions and retiree healthcare, combined with slow economic growth, has left Connecticut in state of near-permanent fiscal distress. Malloy’s 2017 concessions agreement extended the state employee retirement benefits contract until 2027, increased wages by seven percent over two years and granted layoff protection for state employees until 2021 in exchange for some furlough days, higher pension contributions and higher co-pays for medical and prescription benefits. AFSCME Council 4 and AFT held a joint rally in New Britain on Friday supporting Lamont and other Democratic candidates.